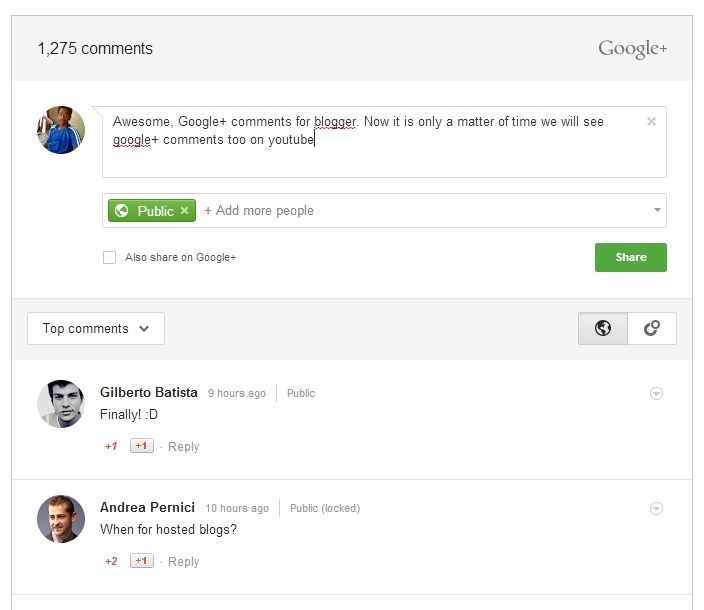 Google blogger team today launched Google+ comments much similar to facebook comments. But implementing Google+ comments on your blogger blog is way much easier than integrating facebook comments. Then click Google+ tab, then you would be taken where you would be asked to “Use Google+ Comments on this blog ” just mark on it. To make Google+ commenting system perfectly working for your blogger blog you need to upgrade your blogger profile to Google+ profile or if you already have upgraded to Google+ profile then make sure your blogger blog link is added to your Google+ about page in contributor section. Google+ gives you the option to comment publicly or privately to your Google+ circles. Your blog post link shared on Google+ when gets comments on it will also be shown on your original post in your website. Older comments will not be removed even after implementing Google+ comments. They will continue to appear in the Google+ comments widget. Note: If you are considering moving from blogspot domain to custom domain then you should active Google+ comments after you have moved to custom domain otherwise you’ll lose all your comments if you change your blog web address/link.